Three weeks ago, SmackDown put RAW under siege. Two weeks ago, Kane attacked Daniel Bryan in Kurt Angle’s office. Last week, New Day caused a distraction that led to Rollins and Ambrose losing their tag titles. Stephanie McMahon heads to the ring. Steph talks about having to make very important decisions in her role as commissioner. She also has to rely on others to help her with those decisions, people like RAW GM Kurt Angle. Angle heads to the ring. Steph asks Angle how New Day got into the building last week. Angle doesn’t know. Steph then asks if SmackDown actually raided RAW last week, or if Shane manipulated Angle once again. Angle doesn’t answer. She moves on and asks Angle whom he named as the final member of Team RAW . Angle responds by saying it was his son, Jason Jordan. Steph wonders why Angle didn’t pick Cena. She also asks what Angle is going to do first at Survivor Series. Angle says he’s going to break Shane’s ankle, but Steph doesn’t think Angle is capable of doing that even if Shane gave him the chance. Steph has lost faith in Kurt Angle in every possible way, so she has no choice in what she’s about to do. She prepares to say something when The Shield (with the returning Roman Reigns) interrupt and head to the ring through the crowd. Dean Ambrose says Angle is a great leader, and he proved he can still get it done in the ring at TLC. Steph asks Ambrose and Rollins where their tag titles are. She also asks where Roman Reigns has been. Reigns is tired of the questions and turns it around, asking Steph where she’s been since going through a table Wrestlemania because of Triple H. Reigns says The Shield does what The Shield wants to do, and The Shield wants to fight New Day. Reigns drops the mic. Good match. I felt like it could have gone on longer, but the short time allowed it to keep the pace high throughout. Bayley and Mickie looked good against each other. Dana looked fine too, but she picked the wrong person to piss off at ringside so she wasn’t as involved in the match as she could have been. I think the correct person won this match though. I like RAW ‘s chances in the women’s match. Enzo Amore and Drew Gulak head to the ring. Amore says he gives 205 Live deep pockets. Kalisto gives the show no pockets. Like basketball shorts. Gulak starts to speak but is interrupted by Kalisto’s music. Fun match. Tozawa and Kalisto made for an exciting team, running and diving all over the place. Gulak and Amore kind of just survived until they were able to take advantage of a situation. I liked the interactions between the teams, and I liked the finish here. Kurt Angle tells Finn Balor and Samoa Joe that they’ll team up against Gallows and Anderson tonight in an attempt to get them both on the same page before Survivor Series. Angle then tells Jason Jordan that he’ll face Bray Wyatt in an attempt to prove to Steph that he belongs on Team RAW. Braun Strowman wants Kane. Angle gives him Kane in the main event. The Miz, Bo Dallas, and Curtis Axel head to the ring for Miz TV. Miz talks about facing Baron Corbin at Survivor Series, that is, unless he squanders his opportunity by losing the US Title to Kalisto on SmackDown tomorrow night. Corbin is known for squandering opportunities, but The Miz does not squander anything. The Miz has another opportunity tonight when he faces The Shield along with his teammates, the new RAW Tag Champs Sheamus and Cesaro. Sheamus and Cesaro head to the ring. The Miz goes back to talking about the opportunity of taking on The Shield tonight, a Shield that hasn’t fought together in about three years. They fought each other for years and came back together for the sole purpose of facing Miz, Sheamus, and Cesaro. An okay match. Jordan started fairly strong, but Wyatt took over and dominated most of the match. The ending was okay, but I don’t think this match proved Jordan belongs on Team SmackDown. It just proved that he can hang for a while and take advantage of certain situations. Bray Wyatt attacks Jason Jordan after the match. He takes the leg that Jordan hurt during the match and slams it into the ring post. Jordan has to be helped from the ring by the referee. Angle asks Jordan if he’s okay. Jordan wants to compete at Survivor Series, but Angle is doubtful if he’s up to it. Able has a big decision to make. Universal Champ Brock Lesnar and Paul Heyman head to the ring. Lesnar has given Heyman permission to “dogmatize” the top five reasons everyone should watch Survivor Series. First, it will be the first time the Universal Champ will face the WWE Champ, and the first time Lesnar will face AJ Styles in the ring. It may be the only time as well. Second, Heyman wants to see Lesnar versus Styles because he has never seen anyone fight Lesnar who can claim to be “better” than him. Third, Styles is the single most talented in-ring performer of this generation, and stylistically, he’s the ultimate opponent for Lesnar. Even so, he will be the ultimate underdog. Fourth, the match could be like a Rocky movie come to life. F5, this is no Rocky movie. Styles can’t survive the onslaught of The Beast. Good match. I don’t know if this was as good as it should have been for three years of buildup, but it was a very fun match. It was pretty standard fare for the first half, but it started to get really good when Reigns and Cesaro spent a good amount of time in the ring against each other. This led to some really great teammwork by The Shield which showed that they haven’t forgotten how to work as one unit. The breakdown at the end was unique in that The Shield worked together to support each other rather than what you usually see in these multiple-person matches where everyone hits a big move then gets hit with someone else’s big move. With teamwork like that, I’m really looking forward to The Shield vs New Day. It could steal the show. Though, so could The Usos vs Cesaro and Sheamus. Kane remembers the sound of the garbage truck crushing Braun Strowman’s body. In the ring, Kurt Angle makes a tough decision. He has chosen to replace Jason Jordan on Team RAW. Jason Jordan comes out the the stage and begs Angle not to do it. Jordan says he’ll be fine by Sunday. Besides, Angle won a gold medal with a broken freakin’ neck. Jordan begs Angle not to take away his one chance to compete in the ring with his father. Stephanie comes out and tells Angle to name Jordan’s replacement now. Before Angle can say anything, Triple H heads to the ring. He doesn’t look happy. 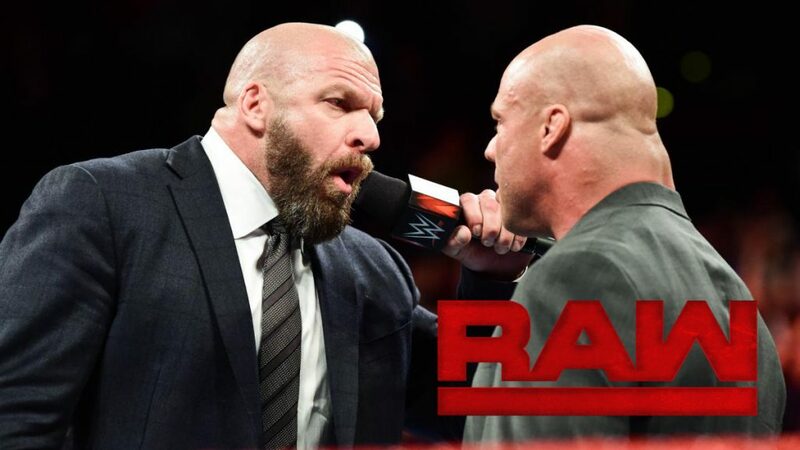 Triple H announces that the fifth member of Team RAW is himself. Jordan still begs, so Triple H gives him a Pedigree before leaving the ring area. ** Begging doesn’t look good on someone they’re trying to build up as a babyface. I feel like they need to go in a different direction with Jordan. It’s just not working. A pretty good match. Two commercial breaks hurt the flow of the match, but the final segment was good. Up to that point it was pretty much just Balor getting beat up and Joe not caring much. The finish had Joe and Balor not so much working as a team, but rather staying out of each other’s way as they each beat up their opponents. I think it worked to show that they can coexist without working together yet still be effective. Charly Caruso welcomes Alexa Bliss and asks her if she’d rather face Natalya or Charlotte at Survivor Series. She doesn’t like either of them, but she’s still interested in the SmackDown Women’s Title match tomorrow night. Regardless of who wins that match, Alexa is confident that she’ll win on Sunday. Kane and Strowman make their ways to the ring for the main event. They stare at each other, but before the bell rings, Kane strikes Strowman. They brawl to the floor and continue the fight around the ring. Kane uses a chair on Strowman, but Strowman fights out of a chokeslam and uses a chair on Kane. Strowman attempts to suplex Kane from the second rope to a table on the floor. Kane gets away, but not for long. Strowman picks up Kane and hits a running powerslam on Kane that breaks a hole in the ring as the show ends. This show was okay, but the main event segment was a bit of a letdown. I didn’t expect much from Kane versus Strowman, but it was really just a plodding brawl which didn’t matter much for Survivor Series. I would think they would want the final segment to be all about Sunday’s show, but this had nothing to do with it other than having Strowman show that he can break stuff. Again. In a way that we’ve seen before from other people. Again. I didn’t care for the final segment of the show for a few reasons. For one, it wasn’t very interesting. It was a slow brawl that wasn’t particularly violent. They even teased a table but didn’t deliver. Second, the beginning of the brawl was strange. The referee was oddly reluctant to start the match for no particular reason. Almost every single time someone initiates contact when both competitors are in the ring, the referee rings the opening bell. Chad Patton didn’t, and there was no reason why. Third, the ring break wasn’t terribly exciting. It needed more buildup. It needed a better feud going into to. It needed to matter. It had none of those things. As for the rest of the show, it was okay. It didn’t feel like the last RAW before a PPV, but maybe RAW will have a presence on SmackDown tomorrow. I’d be quite surprised if they didn’t. I didn’t care for the Jason Jordan thing, but I’m okay with Triple H replacing him. I’d rather have an active member of the roster on the team, but whatever. I mean, putting Wyatt on the team in place of Jordan after Wyatt as the one who injured him would have been a better, more complex story. Plus it would allow for an easy feud coming out of Survivor Series involving Jordan, Angle, and Wyatt. Putting Triple H in the match only really makes for a Triple H versus Angle feud, and unless they’re building towards that at Wrestlemania (which I’m okay with), then Triple H doesn’t really need to be on the team. I liked how The Shield looked (except for Rollins still wearing his vest), and I enjoyed Heyman’s promo. No problems there. I imagine all of these guys except The Miz will have a better match at Survivor Series, but this was the most fun of the night. I think second place would probably be the women’s match, but it was too short for me to pick that.